This expansion kit is compatible with Critical Link’s MitySOM-1808 and MityDSP-L138 based development kits; one is required to interface with this expansion kit. 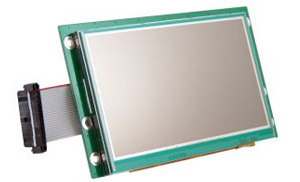 This expansion kit adds a 4.3″ 480×272 pixel Wide Quarter VGA (WQVGA) LCD display to the development kit. This expansion kit features a NEC NL4827HC19-05B display that includes the necessary controller board to interface with the 24-pin LCD connector on a supported development kit.